Wood” and “water” are two words that best define Maramureş. The history, the traditions and the life of the people of Maramureş are carved in the wood of the churches and gates, and numerous rivers and streams are spread along the land like a cobweb, forming famous valleys: Mara, Iza, Vişeu, and Vaser. Among these, of special interest for tourists is the Vaser Valley, which crosses the Maramureş Mountains in the middle of one of the most wild and beautiful landscapes in Romania. The Vaser River is about 60 kilometres long, forming a spectacular canyon-like valley, where precipitous cliffs alternate with dense forests, beautiful clearings and mineral water springs. 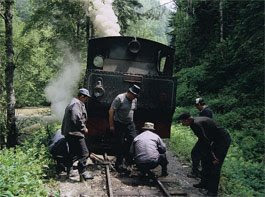 The access point to the Vaser Valley is the town of Vişeu de Sus, which is also the starting point for Mocăniţa, a narrow gauge steam train, the only means of transportation in the valley. The railway runs along the Vaser River and is one of the last remaining steam rails still in active use in Europe, and the only one in Romania still used for hauling logs down from the mountains. Built after the First World War for the express task of transporting wood, it is still – surprisingly – used for the original purpose. Nowadays, in spite of its old age, the steam locomotives have been given one more task: that of transporting tourists. 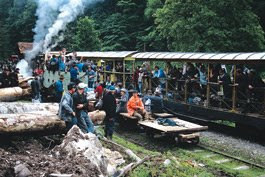 As this place is one of the few where one can ride along in a wagon pulled by steam power, every year the old Mocăniţa attracts thousands of tourists from all over the world, and offers them unforgettable railway trips. Travellers can go by train all the way up to the end of the valley and back, enjoying the beauty of the nature. It is also possible to stop on the way, get off at one of the several halts, halte, and start a hiking trip to the mountains. It all starts at the Vişeu de Sus railway station (Căile Ferate Forestiere Vişeu de Sus, or simply CFF Vişeu de Sus). Since this is not a regular railway station, but a forestry station, there are no passenger platforms. The place looks more like a lumberyard than a railway station, smelling of freshly cut wood. Very early in the morning the Mocăniţa is made ready for the day’s trip. Both the tourist wagons and the forestry wagons are attached to the steam locomotive, wood and water provisions are made – they are the fuel of the steam engine – and the mechanic starts the engine. After some time off the train goes with a long whistle, puffing along the way. Following the cascading river, the train first passes among the houses of Vişeu de Sus. Then, after about seven kilometres, the tracks start to go deep into the wild forest, passing among the steep cliffs of the gorge, and penetrating the mountains through dark tunnels. The silence of the nature is broken not only by the on-rushing tumultuous river and the puffs and hisses of the train, but from time to time also by the sharp whistles of the locomotive. 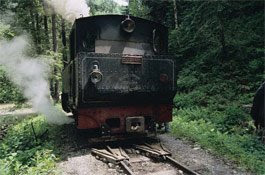 The Mocăniţa creeps slowly up the abrupt slopes and often gives the impression that it can no longer advance and that the steam power is not sufficient. However, it manages to continue the journey and carry the tourists to picturesque places. The journey is long and with several stops. As it ascends, the train drops off empty wagons, which are picked up on the return, piled high with logs. The train also stops when locals are taken on board along the way. They use the train to bring cheese down to the town to sell, and to visit nearby villages. Moreover, several fuelling stops are required, as new provisions of water need to be made. Then the locomotive is unhitched from the wagons and is taken to the river. At its return it gives the tourists a strong shake, just to let them know that they should be ready for continuing the trip. The fuel tender also needs to be filled with firewood. The train can also fall off the rails, but at the slow speed of 10 km/hour that poses no danger. 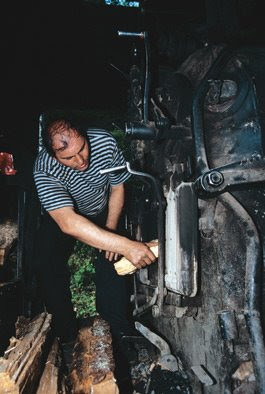 The passengers (who are experienced in the matter) help get the train back on the rails using anything they can lay their hands on: cut pieces of wood, chains, axes, or hooks. A forestry tractor that manages to wallow on in the torrent can give the final push so that the trip can continue. When travelling with the Mocăniţa up the valley one should keep in mind that this is like a journey back in time: after leaving the Vişeu station there is no cell phone signal, and any contact with the modern times is lost; the train is pulled by an antique steam locomotive, and therefore one should pay attention to the soot and sparks that might stain or burn one’s clothes; along the way there are no shops, and provisions of food, water and other consumables have to be made before departure. “Unforeseen” is a key word in the mountains, and it is advisable not to plan anything for the afternoon, as there is no certainty about the return hour: something might break (one has to keep in mind that the line is more than 70 years old and the locomotive can be even older! ), and there might be either trees or rocks on the tracks. As the weather in the mountains is very unstable, appropriate shoes, warm clothes and a waterproof coat are necessary. The Vaser Valley is in the border zone, and a valid identity card or passport has to be brought along. For safety reasons one can get on and off the trains only at the halts, and it is forbidden to jump on or off the train while it is moving. One may only travel in the specially designed passengers’ wagons, and it is strictly forbidden to ride in the production wagons or on the stairs. As these are working trains, one should be very careful when manoeuvres with logs and other equipment are being made. The halts, the majesty of the mountains and the untamed forests, the frenzied river that competes with the noise and sounds of the train, the lumberjacks, the train itself with its conductor, all are a cause for enjoyment, a feeling of adventure, of enchantment. On this train one has to forget the destination, the time it supposedly takes to reach the end of the line, the schedules and other mundane worries of our frantic modern life.